* Gold or Silver Figure? 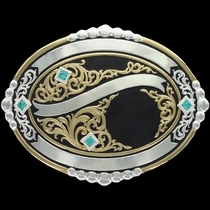 Champion Trophy Buckle from Montana Silversmiths. 3¾" x 5". 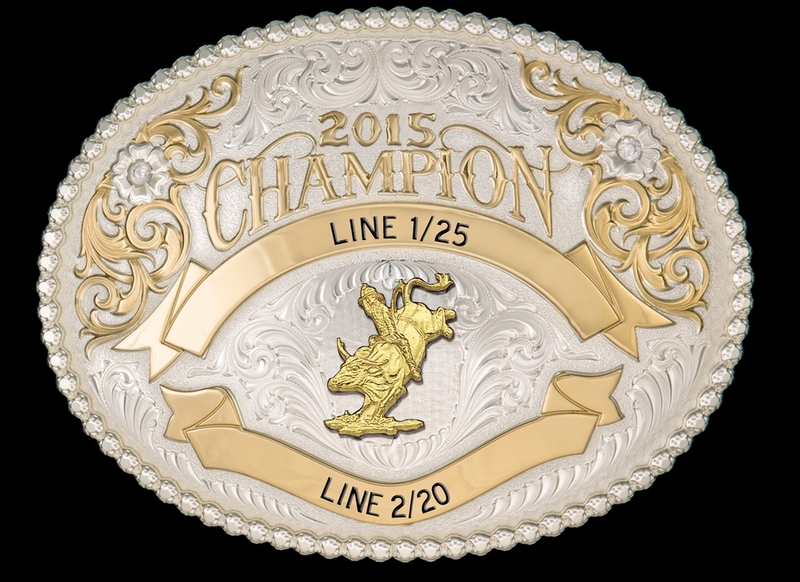 Includes fancy gold CHAMPION lettering and date trim. 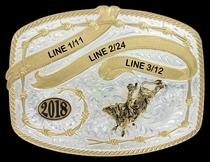 Select the figure of your choice from our catalog (or your brand or logo) and two stones, as well as the engraving of your choice on two ribbons. 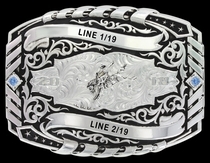 Shown here with Bull Rider figure 646, and clear cubic zirconia stones. 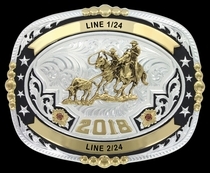 This Champion Trophy Belt Buckle is also available in solid sterling silver (usually price x 3); contact us for a quote. Download the Catalog of Figures here. This Lettering Buckle is also available with an Antiqued Patina. Orders of 10 or more qualify for further discounts. Ships in 4 - 6 weeks. Shipping dates can vary depending on seasonal demand, selected style and parts inventory. "Montana Silver," as it was known in the early years, is protected by Montana Armor®, a Montana Silversmiths technological breakthrough in 1988. 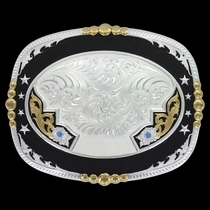 This durable finish gives all Montana Silversmiths champion trophy buckles superior protection. 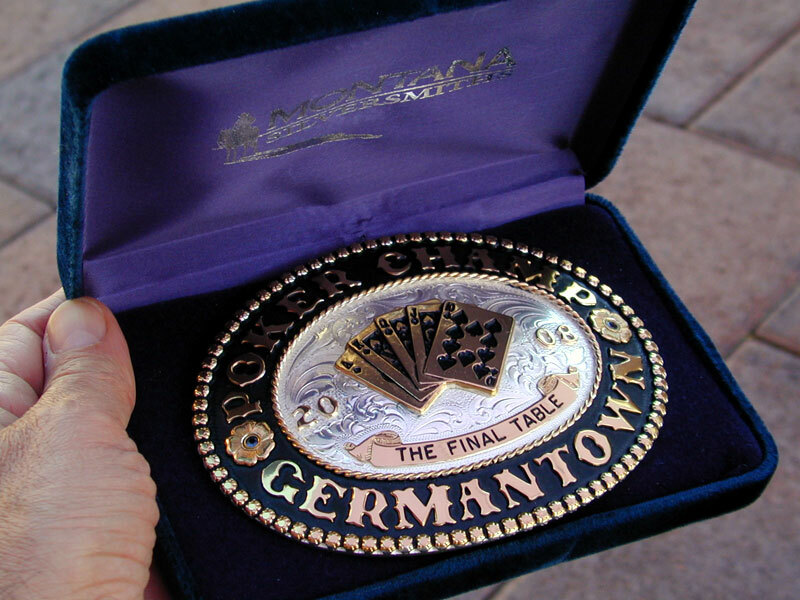 Montana Armor® champion trophy belt buckles will not tarnish and the silver's brilliance can be maintained with an occasional wipe with a damp cloth. It's kind of like saying "If you buy our car, you never have to wash or wax it!" You will not find this valuable quality anywhere else. 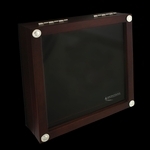 "I wanted to take this opportunity to thank you for all your assistance with my order. This being my first order with you has been such a pleasure. Great communication combined with great service. Gold Mountain Trading sets an example other companies should follow. I have told all my friends to visit your web site and encouraged them to buy from you. Thanks again for allowing me to have such a pleasurable shopping experience with you." Copyright © 2001 - 2019 All rights Reserved.